Joseph Carrington Cabell, Jefferson's principal co-founder of the University of Virginia, was a well-educated man who had studied abroad and traveled with Washington Irving. As a Virginia state senator, he worked tirelessly to promote Jefferson's education bills in the legislature, first to secure approval for a state university and then to obtain the necessary financial appropriations. Turning down offers of government posts and requests to stand for governor and Congress, he served thirty-seven years as a member of the Board of Visitors and as Rector, shaping the young institution as no other. 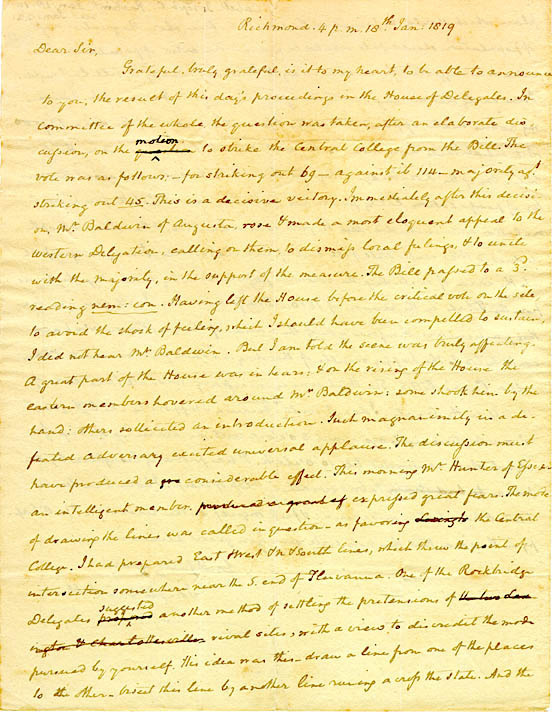 On January 18, 1819, he wrote to Jefferson, "Grateful, truly grateful, is it to my heart, to be able to announce to you...a decisive victory." The University would be established. Delegates from the western counties had withdrawn their objections to a central university. "The scene was truly affecting. A great part of the House was in tears...." Seven days later the charter for the Central College was granted.